Thanks to all the artists, supporters and volunteers who made ONO #2 possible. It was a great night and we hope you enjoyed it as much as we did. Stay tuned for future ONO events or contact us at onoproject@gmail.com. Also- see links below for info on how ONO #2 went and to take a look at the art. ( please excuse my luddite link posting- I am in the meatworld today). LOVE from all the ONO team. ONO Project is a Hobart based collective focused on repurposing disused urban space for ground breaking art and sound events. On the 26th of November artists will inhabit and re-activate an empty building near you. Artists include, CHRONOX, Sally Rees, Matt Warren, Evil Goat, Scot Cotterell, Jacob Leary, Andrew Harper, Emma-Jean Gilmour, Pip Stafford, Kate Kelly, Nicole O’Loughlin, Froth Industries, Nancy Mauro-Flude, Tristan Stowards, and more. Details of the venue will be available via email, SMS, Facebook and word-of-mouth in the week leading up to the event. After 15 years of waiting, and praying, Lightning Bolt are finally touring Australia! Hailing from Rhode Island, USA, Lightning Bolt is a noise rock duo consisting of bassist Brian Gibson and drummer Brian Chippendale. Last we left this amplified tribe of two on 2005s Hypermagic Mountain, Lightning Bolt were tossing thousand of years worth of musical history into a wood chipper and coming up with some chewy chainsaw taffy. The new album, Earthly Delights, embarks on a musical journey that will take you to places both divine and sublime. 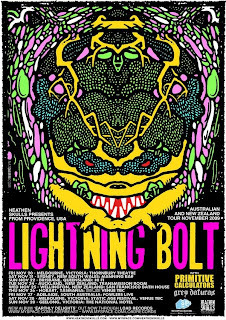 Lightning Bolt are presented by Heathen Skulls and Street Press Australia. Supported by the Premier's Arts Partnership Fund. Stay tuned, Spring is here and our noses are on the ground for new venues. Andrew Harper, Scot Cotterell, Tim Noble, Braddock (city lights/froth industries), Empire (die laughing), Kirsty Madden, Ghostpatrol, Jamin (die laughing), Lisa Campbell-Smith, Andy Vagg, Lachlan Conn (forepaw), Lindsay Cox, Michael Prior (tape projects),Lindsay Arnold, Moira Corby, Pip Stafford, Kate Kelly, with performances by Cycle, Chrysalis, Global Ethnic (lach conn and michael prior), and Please if I have missed anyone, feel free to beat me about the cranium. Also, thankyou documentation photo credits to Nic Fitzgerald, Shaun Wilson,Emma Maloney, Matthew Bonner, Kelly Eijdenberg, Craig Opie- (CAST and Artlink images),Guy Hawksley- Video Doc, Moira Corby, Lisa Campbell Smith,Nadia Abdulrahim. is a collective focussed on using disused or abandoned urban spaces in One Night Only art events.